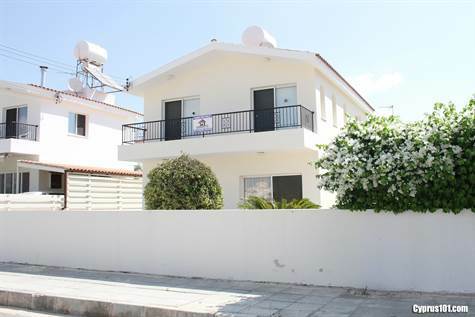 Villa in Mandria, Paphos – This spacious 3 bedroom detached property is located in a quiet residential neighbourhood of Mandria, which is the perfect little village on the outskirts of Paphos. It is a 5 minute drive from Paphos International airport, a 15 minute drive from Paphos and 25 minutes’ from Limassol. There is a good range of local tavernas and shops in the centre of the village which is within easy walking distance of the property. The coast and beautiful beaches of the area are also a short stroll away with many enjoyable walks on quiet rural pathways in the local countryside. The ground floor features a guest toilet and spacious open plan living room including lounge, dining area and corner kitchen. The kitchen with breakfast bar is well equipped with built-in oven, electric hob, extractor fan, fridge freezer, washing machine, dishwasher, microwave and plenty of worktop space. Patio doors from the lounge and dining area provide lots of light to the living space and provide easy access to a good size covered veranda and low maintenance landscaped gardens. A ceramic tiled staircase leads up to a spacious landing, large master bedroom with en-suite shower room, two double bedrooms and a separate family sized bathroom. All bedrooms have fitted wardrobes and lots of storage space. Accessed directly from the master and second bedroom is a long balcony with gorgeous rural and distant sea views. Outside, to the rear of the property is a BBQ area, fantastic for entertaining guests during those warm balmy nights. There is ample space to build a large BBQ if required, plus a comfortable seating area. To the side of the property is a gated driveway which can easily accommodate 3 cars. The property is ideal as a permanent residence or holiday home, comes fully furnished and has title deeds.